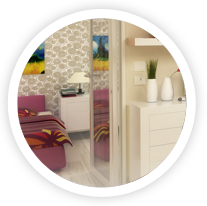 The furniture in this category includes a bed with an adequate mattress recommended by our medical staff, a built-in wardrobe with dimensions 80x240cm per person, a bedside table, a dresser, an armchair, and a series of small things making a comfortable stay. A room in all equipped as double room, with additional kitchenette, a living-room furniture suite, a desk, and ambient lighting. 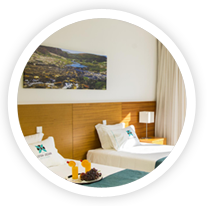 This accommodation category enables you to receive guests within your accommodation unit, and provides you with complete peace and autonomy within our facility. It consists of a living-room with a combined dining space, a sitting area and a desk, a kitchen niche, a balcony with rattan garden furniture suite, a sleeping area with a French bed and built-in wardrobes. The suite can be used by one or two persons. 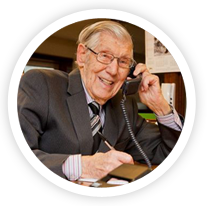 We offer a special accommodation for the persons that have not ceased with their business contacts and activities, although being in their seventies or eighties. This service includes a personal business secretary, a driver, a travel organisation, receiving business partners at home, hunting, fishing, and many other benefits. You can obtain more detailed information regarding the type of service, with full discretion of the agreement, in the direct contact. All rooms, from any category, have private bathrooms, TV sets, radio devices, telephones, Internet connection, panic tasters, and are additionally equipped with the necessary elements for less mobile persons according to your wish and the recommendation of our doctors. The entire space (corridors, common premises and rooms) is connected to the central heating system and air-conditioned. On each floor, there is a living-room area, with kitchenette, library, computer, satellite TV, furniture suite and all contents for comfortable stay and leisure. This area has a spacious terrace with a panoramic view of the top of Kosmaj and colourful surroundings of our facility. The nurse on duty, on each floor, has his/her study equipped with ambulance inventory and connected with panic tasters of all accommodation units. The home tenants have at their disposal a central infirmary, a physiotherapy room, a modern equipped recreation block, a hydro-massage room, a festivity hall for dining and celebrations, a coffee shop, a beauty parlour, a hairdresser, a pedicurist, and a use of the hotel-type services. A vertical communication within the facility is carried out by two elevators, and the whole internal and external space is adjusted for moving of less mobile and disabled persons. The facility is surrounded by 40 ares of the arranged park, with the devised contents for walk, sitting and recreation, with a lake and a homeopathic garden in its centre. 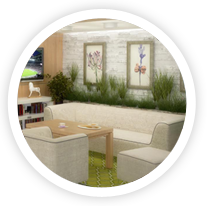 Outside of the arranged garden, the users of our home have at their disposal a yard, where it is possible to independently grow plants, as a hobby, and to socialize with the pets they have brought with them or acquired later on.